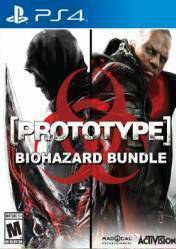 PROTOTYPE BIOHAZARD BUNDLE is a pack that includes both titles of this action game at an incredible price. On the one hand we have the first installment of PROTOTYPE, where we will discover our powers thanks to evolution. We will play as Alex Mercer, a genetic mutant with no memory of his past, determined to solve the mystery of his existence as he travels through densely populated New York City, moving fluidly and consuming anyone who stands in his way. In the second installment of PROTOTYPE, it maintains the same tone as the original title and continues the experience of becoming the ultimate weapon thanks to the powers of evolution. In this installment, a devastating viral outbreak has claimed the life of Sgt. James Heller's family and transformed them into a living weapon capable of adapting to any situation thanks to genetic mutations. prototype 1 is one of the best. the graphics are lower but i liked the free roaming more and you have some mor combo's with hand and feed, but prototype 2 is also alot of fun.